LAST CHANCE: Get 1,000 FREE Clubcard points when you get the free Tesco Mastercard! This is your final warning! The current generous extra Clubcard points offer currently running with the free Tesco Clubcard Mastercard ends in six days. We don’t often see a sign-up bonus on the free Tesco Clubcard Mastercard so this deal is well worth a look. Until 18th September, Tesco Bank is offering a sign-up bonus of 1,000 extra Clubcard points when signing up for a Tesco Clubcard Mastercard. This means that you will receive up to £30 of Clubcard Boost vouchers when you convert the points. That’s not a bad return for a free credit card. The credit card that qualifies for this deal is the ‘purchase’ version of the card. You need to apply for it via this link here. It comes with 0% interest for up to 20 months of new purchases. The representative APR for the card is 18.9% variable. The Tesco Clubcard Mastercard has no annual fee. The interest rate is 18.9% variable – this is way more than the cheapest card on the market which is about 7% per year, so avoid it if you do not clear your balance every month. In order to receive the sign-up bonus you need to make a purchase or transfer a balance within 2 months of opening the account. 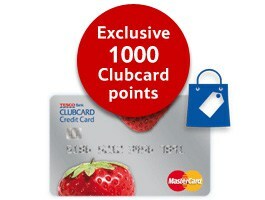 With this Tesco Mastercard you will be rewarded with extra Clubcard points every time you use the card in Tesco. You will receive 1 extra Clubcard point for every £4 spent – this is on top of your usual Clubcard points. The earning for general purchases outside Tesco is less exciting. You receive 1 Clubcard point for every £8 you spend, and this is based on rounding down each transaction to the nearest £8. If you spend for example £7.99 you will receive no points at all and everything between £8 and £15.99 will give you only 1 point. With 1,000 Clubcard points available for a limited period, the Tesco Clubcard Mastercard card is worth a look as long as you intend to clear your balance every month and not incur interest at the toppy rate of 18.9% APR. Paying 0% interest for up to months on new purchases is also worth having. You can apply here. PS. Don’t forget that American Express is currently offering 20,000 Nectar points when you sign up for their card. You can find out more in our review of the Amex Nectar credit card.